If you are charged with a felony offense, you might be able to get your case dismissed at the grand jury level within one to two months of being arrested. Because State Prosecutors rush to get their felony cases indicted by the grand jury within one to two weeks after an arrest, it is important to retain an experienced Fort Bend County criminal lawyer as soon as you are arrested or know you are under investigation. Your attorney can then sign onto your case in court and request the State to hold the case from the grand jury in order to prepare a defense. Since 1994, Sugar Land Criminal Lawyer James Sullivan has worked to get dozens of felony cases no billed by the Grand Jury. These felony cases include Sexual Assault of a Child, Attempted Murder, Aggravated Robbery, Aggravated Sexual Assault of a Child, Aggravated Assault, Assault Family Member by Impeding Breathing (choking), Forgery, Evading Arrest by Motor Vehicle, Injury to a Child and Burglary of a Habitation. The graph below lists 34 of those felony cases that were either no billed by the Grand Jury in Harris County (unless otherwise noted) or dismissed by the State based upon the defense packet since November 2008. Attorney James Sullivan is an experienced Fort Bend County Criminal Defense Attorney serving Greater Houston and Texas since 1994. Contact James Sullivan and Associates at (281) 546-6428 to discuss your case. James Sullivan graduated the Trial Lawyers College founded by Legendary lawyer Gerry Spence. Sullivan has a proven record of defending people from all walks of life, faiths and countries in courts throughout Texas. 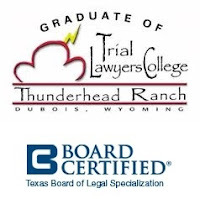 Sullivan is also Board Certified in Juvenile Law by the Texas Board of Legal Specialization.